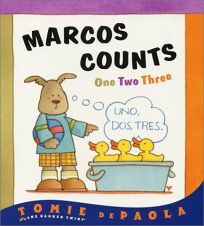 Tomie de Paola brings back the Barker Twins in two bilingual concept books, Marcos Counts and Marcos Colors. In the first title, the youngest Barker learns to count from one to 10 from Moffie, who presents the numbers in English while Marco repeats them in Spanish. They count everything from three-tres-rubber ducks to eight-ocho-crayons, until Marcos leaves and returns with 10 red roses for Mama. In Colors, Moffie's twin brother, Morgie, presents the colors that Marcos repeats in Spanish. The art depicts appropriate objects such as a pumpkin and a tabby cat in orange, or naranja.